Beautifully Restored! This apartment is on the top (2nd) floor of a very tastefully restored Tuscan palazzo/villa in a quiet hilltop village 30 minutes east of Pisa. It comprises a well proportioned sitting room with kitchen and dining area, 2 spacious double/twin bedrooms with 2 bathrooms and a private hallway. The décor is typically Tuscan with beamed ceilings and terracotta floors. It is furnished with traditional painted furniture. Ideal as a self-catering holiday rental with a swimming pool in the shared gardens, there are stunning views over the Tuscan hills from all the rooms. It is perfectly located 10 minutes drive from the main road link between Pisa and Florence. A perfect base for touring as well as relaxing by the pool. There is are simple shops a Post Office and Bank ATM along the main street from the front door with supermarkets and restaurants all nearby, the closest being on the main road to Ponsacco. All modern conveniences including central heating and air conditioning. Come and enjoy a lovely piece of Tuscany! So much to See and Do!! : Tuscany is renowned throughout the world for its breathtaking landscapes, its classical art and its rich history. The rolling Tuscan landscape is punctuated by Florentine cypresses, terraces of olives, bursting vineyards and stunning hilltop towns and villages. The cities are packed with cultural attractions, whether you want to browse and photograph the beautiful architecture, visit many of the churches or galleries to appreciate the wealth of medieval and renaissance art and sculpture. Driving around Tuscany is a visual feast to be enjoyed at leisure. There is so much to appreciate within 45 minutes of Soiana alone. The drive to Volterra, a fabulous hilltop Etruscan city to the south of Soiana, is a beautiful experience. You may want to just stop and paint it!! So much to Eat!! : Food is one of the great Italian passions and Tuscany is full of fantastic Restaurants, Cafes and Bars. The cuisine is based in simple peasant food relying on basic staples such as olive oil, for which the region is renowned, tomatoes, beans, hams and salamis. Pasta is followed by grilled or roast meats or pan fried fish. Cheeses include Pecorina and Ricotta. Delicious snacks like Bruschetta are a must! The raw materials are all available in the markets and shops - so start cooking! So much to Drink!! : Tuscany is a great wine producer and probably the most famous is Chianti. 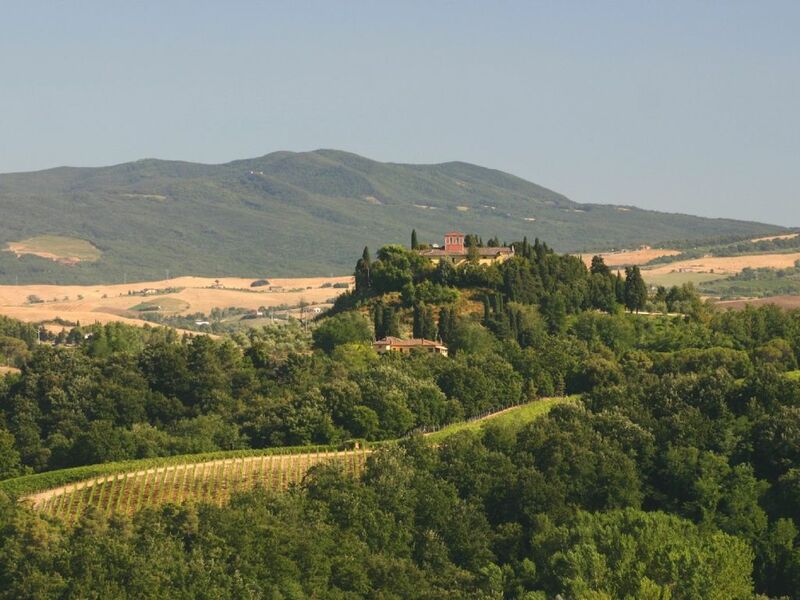 Although Brunnello di Montalcino and Sassicaia are considered Tuscany's primo wines, there are many others that are superb. Aperitivos are another wonderful pastime! Enjoy a glass of Prosecco or a Campari Orange at a bar in an old piazza and watch the world go by!! I am English and have connections with Tuscany. I love the Italian way of life and have been coming to Italy for the last forty years. I never tire of the delicious food, wonderful wine and the stunning views of the tuscan countryside. I wanted to have an apartment in a renovated Palazzo in the triangle between Pisa, Florence and Siena. Sioana is ideally located only 30 minutes from Pisa airport and is a quiet hilltop village to return to having visited some of the fabulous cities and hilltop towns in this region. The apartment is light, spacious and comfortable and shares a lovely swimming pool in the garden. Absolutely loved our stay in Soiana in this beautiful spacious apartment with breathtaking views over the landscape. A great location too for visiting the many beautiful Tuscan villages. The swimming pool was great and used daily for a cool down after our sightseeing days. The garden, pool, location and this Palazzo accommodation did not disappoint. Would definitely recommend without any hesitation. Thank you Nic for your communication throughout and your directions from the airport to the apartment are spot on. Our first visit to Tuscany but it will not be our last. Lovely to arrive at such clean and elegant accommodation. Comfortable beds and sitting area and great to have parking on site too. So glad you enjoyed the apartment and Soiana! excellent location for exploring Tuscany..great little village with extremely welcoming and friendly local people.The views from the apartment are ridiculous i spent every day at some point just sitting and staring out of the window! we really enjoyed the late night swimming at the spa pool in casciana terme (open 8-midnight weds and fridays only in the summer) great to swim in the 36 degree thermal waters. eat at il Merlo beforehand in my opinion best restaurant there (mussels and their ravioli very good). A drive to Pontedera (park near the hospital in the white boxes and its free all day) opens up the rail network cheap and very easy to use we went to Florence and Pisa this way. furthest we drove was up into the mountains above Carrara(fantiscritti) this was stunning and well worth the trip. The pool was well maintained clean and the kids loved having this to occupy them if we stayed around the house for the day. A car is essential and i really enjoyed finding all the little places in the surrounding hills(found a really nice vineyard doing this and la fornace restaurant worth a visit) and visiting the supermarket! Conad gets my vote.. the attached cafe does great coffee and a kind of coffee flavoured iced drink called gran creme i think? addictive! worth mentioning the 2 flights of stairs up to the spacious apartment, it didn`t bother us as were all fit and healthy but might be an issue for the elderly? it was certainly worth it to have those views and burn off some of the gran creme calories! Oh and its pronounced Soy-Ar- na according to the chef at La Fornace! Great holiday great choice for us molto buona! It is really great to hear you had such an enjoyable time. I shall add your recommendations to my guest information sheet! Your comment about the views from the apartment is particularly lovely as this was the reason I fell in love with this Palazzo apartment! La vita è bella!! This apartment definitely lived up to the description on the website. Worth it just for the views from the apartment. On our arrival we found the apartment very clean and tidy. The beds were extremely comfortable, probably the best we have experienced in Tuscany. The village of Soiana is quiet and pretty, the Deli opposite was useful for daily provisions. The Pizzeria was handy to walk to and the meals were good. The locals were friendly and you could watch them in the evening congregating outside the bar near the apartment. So if you want to experience the life in a typical Tuscan village this is the apartment to be in. This was our family's first visit to Tuscany and we could not decide just where to stay, in the north, in the south, on the coast, Pisa, Florence..? The decision was made to pick somewhere in the middle and Soiana was the first pick. The apartment is central and with the help of GPS and the owners very helpful directions, was easy to find, even in the dark. The apartment was very clean and comfortably appointed with lots of space and parking in the back. Despite the village being small in size, there are an assortment of restaurants in and around, and you're still not far from the larger town of Ponsacco. From Soina, we were easily able to drive to places like Pisa, Florence, Luca, Livorno, Barga and Voltera. I would recommend this lovely apartment in Capannoli to my family and friends as a great place to stay. Soiana is a quiet hilltop village south of the plain between Pisa and Florence. Only 30 minutes drive from Pisa Airport, it is perfect for visiting the cultural capital of Tuscany - Florence - 60 minutes by car or by train from nearby Pontedera. Here you find the frescos of Fra Angelico at the San Marco convent, Michelangelo's David at the Academia, as well as the Uffizi gallery, home to stunning works by Giotto, Botticelli, Leonardo da Vinci and Raphael to name but a few. Siena, 80 minutes away, is famous for its Duomo and Piazza del Campo, home of the Palio as well as an enormous array of renaissance art. Lucca, only 45 minutes away, is surrounded by massive 15 C walls enclosing a delightful city. Stop for a coffee or an ice cream in one of the piazzas while shopping. You can hire bicycles and cycle on top of the walls! Pisa, only 30 minutes away, is not only famous for the Leaning Tower, but also a stunning Duomo and Baptistry. When you return exhausted - relax by the pool!! Other Activities: Relaxing By the Pool! The following are included: Bedlinen and Towels (but not Beach or Swimming Towels), Electricity and Water. Air Conditioning.